4 Bedroom Detached House For Sale in Oxted for Price on Application. Subject to the usual consents. 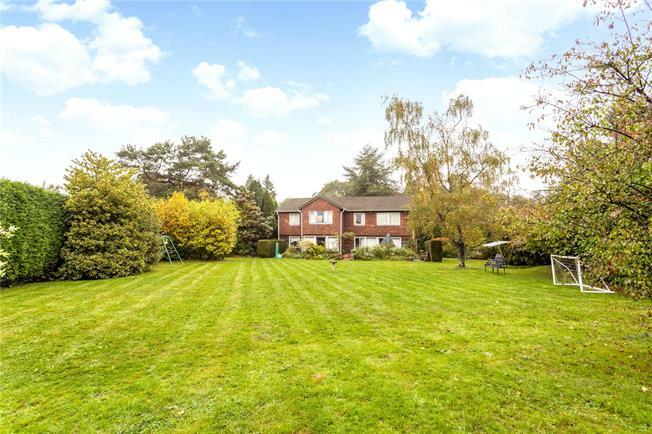 The property is located in a prestigious, private residential lane on the outskirts of the popular village of Limpsfield which has a shop/post office, public house, golf club, cricket club and a well known tennis club. Nearby are the wide open spaces of Limpsfield Chart and the town of Oxted which has a wide range of shopping facilities, coffee bars and restaurants. Oxted Station has fast train direct services to London Victoria (40 mins) and London Bridge (33 mins). The locality is renowned for its choice in schooling at both primary and secondary levels and includes nearby Hazlewood Prep School, Oxted, Caterham and Woldingham School. The property is approached over a gravel driveway with a turning circle and spur leading to a garage and outbuildings. There is additional parking for a number of vehicles. The mature gardens are a particular feature of the property, enjoying a level plot, of about 0.93 acres with a south easterly aspect. The grounds are predominantly lawn bordered by mature hedging and tall trees. Application is going in under permitted development for a 3423 sq ft family home with indoor pool complex.